The Frist Art Museum will offer its first docent training class since 2015 this spring. Frist docents give exhibition and architecture tours to K-12 students, college students, and adult groups. We welcome prospective docents of any background, ages 18 and up. You do not need to have a degree in art history – just a love for the Frist and a desire to engage with our visitors. Dependability, promptness, and professionalism are a must! READ a recent article in Rover about the docent and volunteer program. 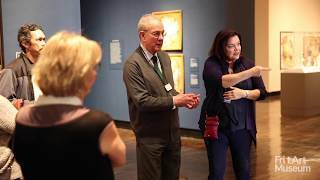 The Frist Art Museum’s docent program is a vital component of our organization. Docents are on the front line, meeting visitors and telling the stories of our changing exhibitions. Docents may be the only representatives our guests meet, and their ability to provide a positive experience is critical. Education and curatorial staff work closely with docents to ensure they have the skills and knowledge necessary to perform their services well. Participation in the Frist Art Museum’s docent program requires a significant degree of time and dedication, but the experience is enriching and rewarding. The Frist Art Museum provides opportunities for docents to participate as either weekday or weekend guides. Weekday docents conduct scheduled tours for student and adults, as well as walk-up tours. Weekend docents conduct both scheduled tours and walk-up tours for adults and families with children. Engaging personality and excellent communication skills. Strong interest in the visual arts and culture and a genuine interest in teaching others. Professional attitude toward fellow docents, Frist Art Museum staff, and the public. Dependability and promptness in attending all training sessions, meetings, and tours. An initial commitment of two years. After the first two years, docents may continue year by year. Docent candidates must attend all scheduled docent training sessions. All docents must attend exhibition training sessions, research and prepare tours, and attend continuing education classes as offered. To maintain standards of excellence, all docents must participate in an evaluation process.